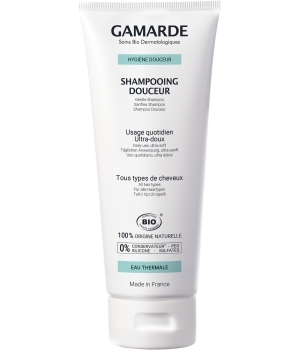 Certified organic and from 100% natural origin, the GENTLE SHAMPOO FOR DAILY USE, rich in soothing essential oils, gently cleans and preserves the balance of normal and sensitive scalps. Brings softness and lightness to the hair. Bitter orange essential oil*: revitalising, toning and balancing. Niaouli* and clove* essential oils: purifying. Juniper* and pine* essential oils, blackcurrant extract: anti-inflammatory. Sodium cocoamphoacetate (and) glycerin (and) lauryl glucoside (and) sodium cocoyl glutamate (and) sodium lauryl glucose carboxylate, Gamarde aqua (Gamarde Water), Lavandula angustifolia (Lavender Flower) water*, caprylyl capryl glucoside, cocoglucoside (and) glyceryl oleate, cocamidopropyl betaine, Cymbopogon martini (Palmarosa) oil*, Lavandula angustifolia (Lavender) oil*, Lavandula latifolia (Lavender) oil*, Eugenia caryophyllus (Clove Flower) oil*, Cupressus sempervirens (Cypress) oil*, Citrus aurantium amara (Bitter Orange Leaf) oil*, Melaleuca viridiflora (Niaouli Leaf) oil*, Juniperus communis (Juniper Fruit) oil*, Pinus sylvestris (Pine Leaf) oil*, Ribes nigrum (Black Currant Leaf) extract*, citric acid and ingredients naturally present in the essential oils : eugenol, farnesol, geraniol, limonene and linalool. For more shine, rinse with cold water!